Redlands, Calif. police recovered this cow costume representing the Chick-fil-A "Cowz" mascot after it was advertised for sale on Craigslist. The costume was one of two stolen from a storage facility. 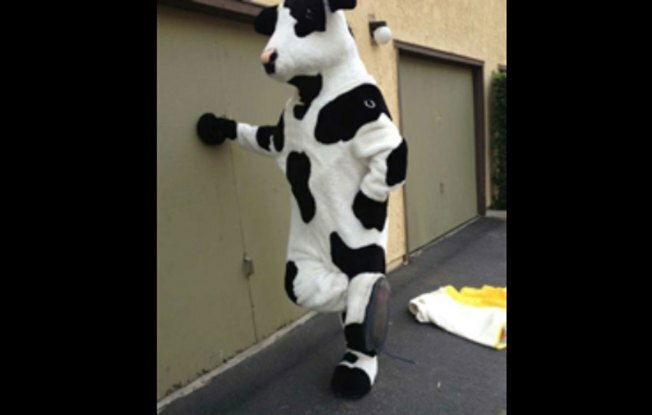 Two cow mascot costumes missing from a Southern California Chick-fil-A storage facility were recovered and one man was arrested after officers found the items for sale on Craigslist. The 7-foot costumes represent the fast food restaurant chain's "Eat Mor Chikin Cowz." They also make great his-and-hers Halloween costumes -- or so a Redlands police officer posing as a potential buyer told the seller after responding to the Craigslist ad last week. The seller told the caller he would give him the two costumes for $350 apiece. The officer met the seller at a San Bernardino apartment complex Oct. 30 and arrested 43-year-old Robert Michael Trytten, of Riverside, after he arrived with the cow costumes, police said. The costumes, valued at $2,800 apiece, were reported missing earlier this year from a Redland's storage facility. Officers also recovered a pop-up canopy taken from the restaurant. The items were returned to the business. Trytten was arrested on suspicion of possession of stolen property. Bond was set at $275,000.